Large: sufficient pieces to comfortably cover a 6 x 4′ area. Comprehensive: lots of generic foliage, plus a variety of more interesting scenario and narrative driving pieces (hostile plants mainly). Integrated: I have two terrain mats/sets, one wasteland and one urban. I dont want to have a third for numerous practical reasons. So the jungle had to fit in with the wasteland terrain (like my graveyard). Easily stored: there is no point making some heavily modeled terrain pieces that look great but cannot be stacked somewhere: they will just get dusty and broken. I have learned that lesson. I wont make that mistake again. Probably. Durable: I dont want to have to make another astro jungle. This is the last forest terrain set that I will ever build I hope. Modular : I like my area terrain to be easily broken into smaller parts that can be used in concert with other elements. Woods + hill = wooded hill, plants + ruins = overgrown ruins etc. This gives me the most flexibility with my terrain sets and aids storage. Im obsessed with storage. 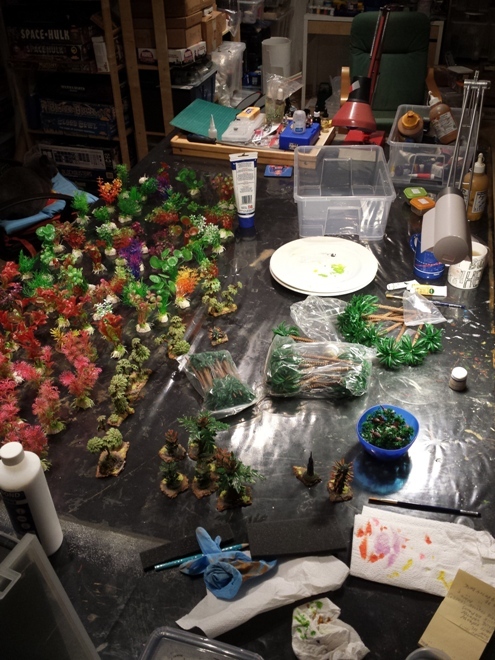 Practical: extensively modeled forest models complete with rocks and ruins and undergrowth are beautiful to look at, but usually a lot of hassle to place miniatures in and around. I wanted to avoid that issue. 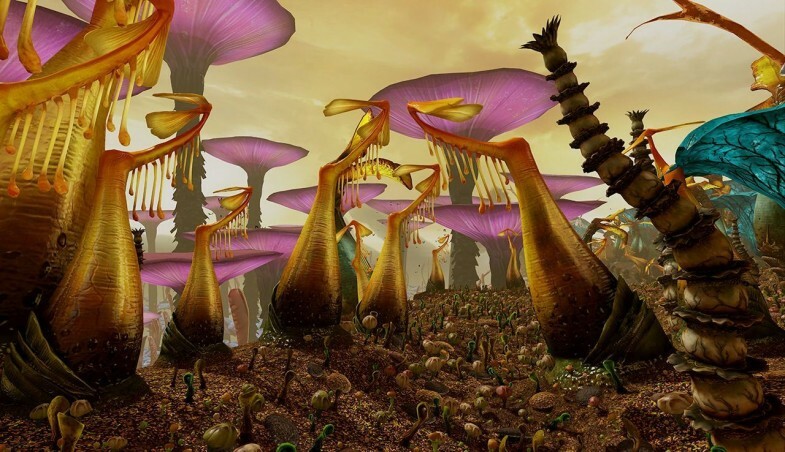 Sci-fi: while there is nothing wrong with Earth like foliage plus an occasional alien thing to represent an extra-terrestrial forest, I wanted my forest to be alien and unfamiliar through and through. Science-fiction gaming is my chosen “period” and I have purged my miniature collection of more or less everything that doesnt tie in with that, which means that I dont have to maintain cross compatibility with other genres/periods, so I can push this project to be alien. 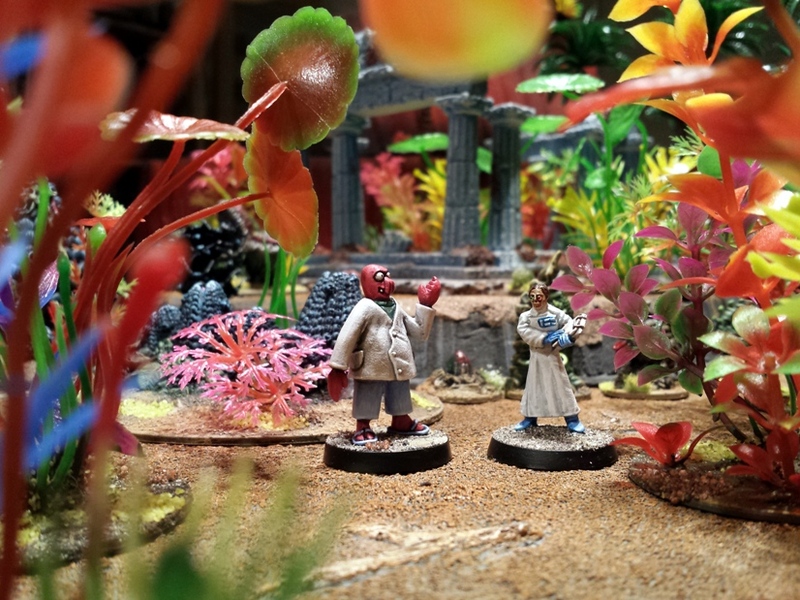 Budget: always a factor, but as I have spread the expense of accumulating the items required for this terrain set over the last three or four years its less of an issue than might be expected. I didnt plan it that way of course, but its how I tend to accumulate things for most of my hobby projects. Achievable: having a wonderful plan for hand-crafted custom items is one thing, having the resources to get it seen through from start to finish is another. Im goal orientated and achievable goals give me enthusiasm to engage in further projects, whereas having badly planned projects stall makes me demoralised. So finding the correct balance of work versus quality is key. Still with me? Next up was inspiration/research. Visually I wanted the table to look at least a little bit like the Star Wars planet “Felucia”: bright and unfamiliar. 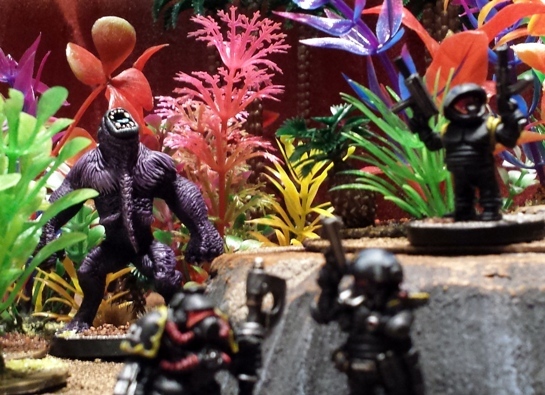 The most interesting plants in my miniature jungle have been documented already HERE, HERE and HERE. This post is about making the more “common or garden” parts of the jungle. So here goes. 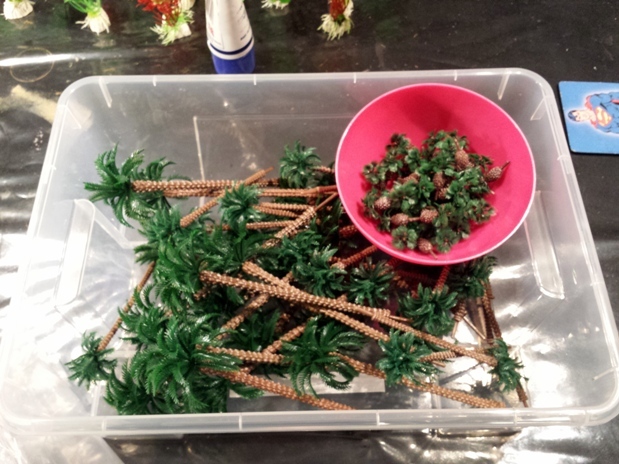 I bought plastic palm trees and aquarium plants on Ebay. I focused on getting as many interesting bright colours as I could, rather than just green. The aquarium plants were supplied attached to some sort of water resistant plaster ballast. 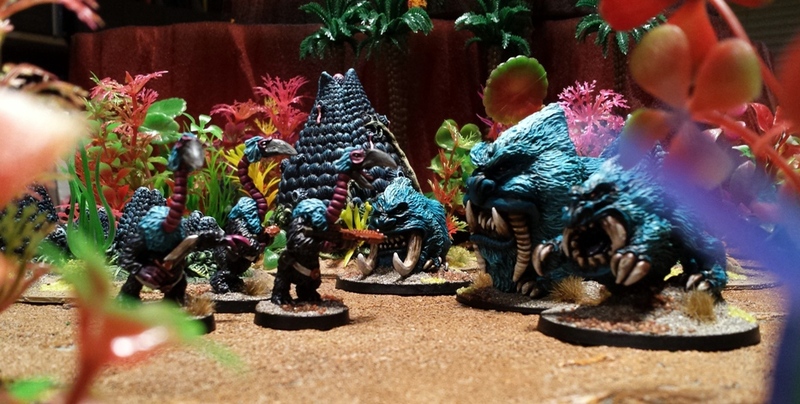 I considered leaving them attached and blending them into the plastic bases, but decided that the foliage needed to mixed up more than that in order to look the way I wanted it too. That decision added huge time to the project, but did make for a better end result in my opinion. 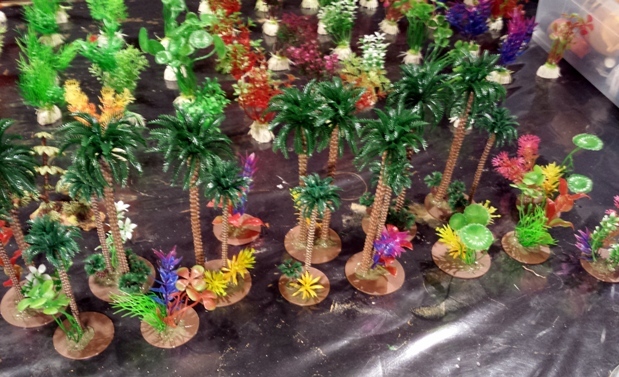 The plastic palm trees were glued into holes drilled in the brown plastic bases from Renedra. Three of these fit on each of the CD bases that I prepped last year. 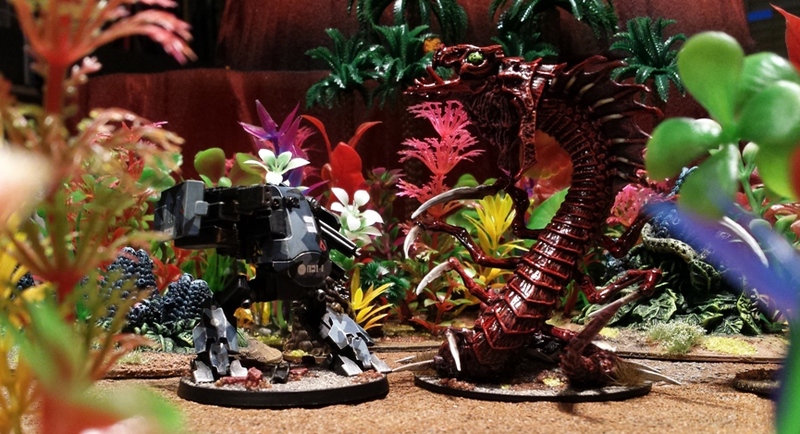 They can be moved to allow miniatures to be placed “in” the jungle/on the CD base. The long process of sticking bits of plastic plant to the bases and then texturing them with various mixes of filler and sand started here. Skip forward about a week and it was done. I set up a few shots to illustrate. Bear in mind that I cant get very good lighting on large areas currently, so these shots could be better. They illustrate the overall look though. Smarter than the average cudbear. The Mouthicans defend Mouthonia from men in shiny rubber suits. Super lightning awesome mecha dragon fight! 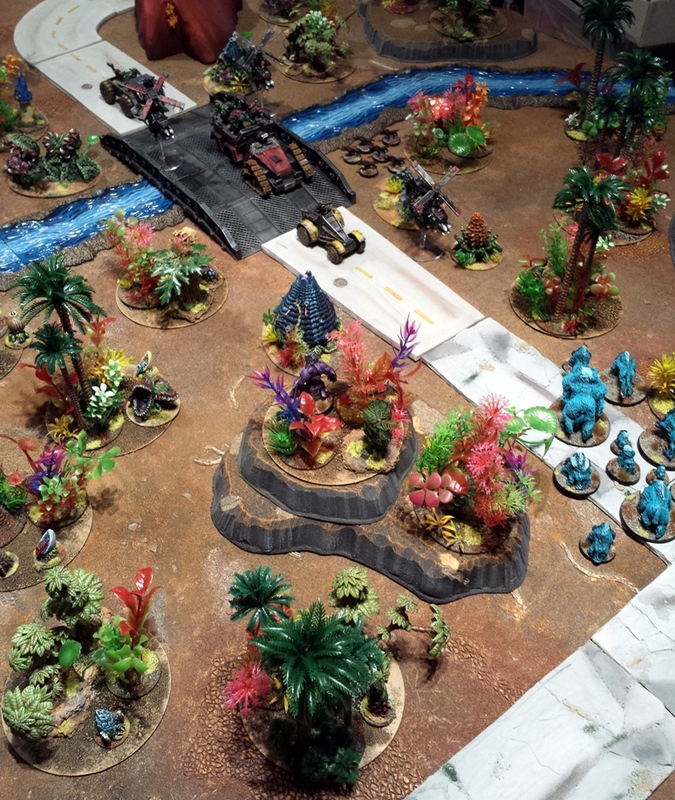 After about a month of working on various miniature space jungle stuff, Im a bit too close to the project to see it properly: I literally cannot see the wood for the trees. I think that the project is a success, but it will be a month or six before I can see it reasonably objectively. Thanks mattblackgod, for the compliment and for sharing the images of your own work. Some of the shots of your jungle were very helpful to me during the planning stages of this project. Very cool to get that lot finished, great work. The photos came out pretty good I think. Thanks, it was a substantial bit of work alright. There isnt enough fill lighting in the shots, but that was bad planning by me really. The next time it will be a bit better. You are right though, the photos are not that bad and they convey the vibe of the thing pretty well I think. I also like how you have carefully considered the practicallity of every item. Are you by any chance an engineer? Great job, Paul! 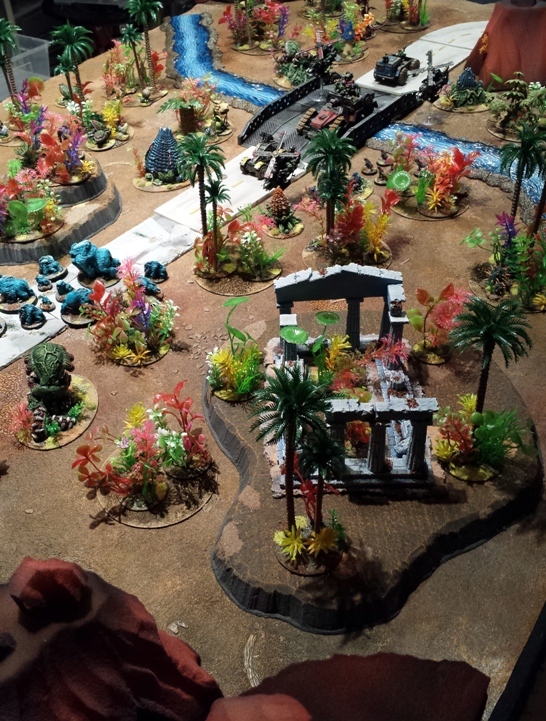 I’m still reeling from building my jungle terrain a few years back, never again. I totally see your point about durability! Thanks Mikko. 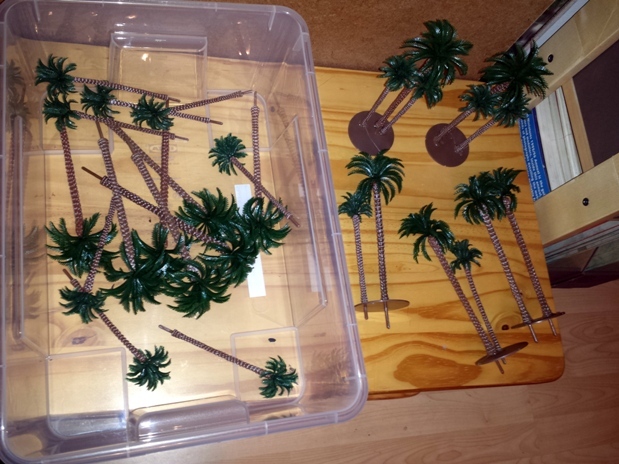 I bought my palm tree models from the link to the the Ebay seller that you provided you with the same items actually. Assembly and finishing of all of those tree bases was tedious, slow and time consuming. 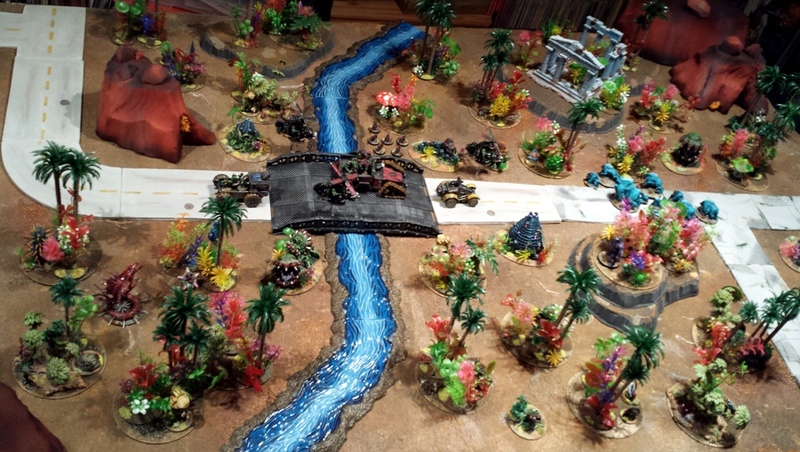 I am pleased with the result and getting a jungle table ready to game on has been on the to-do list for over twenty years, but frankly I am glad that its finished now. I love the colours! 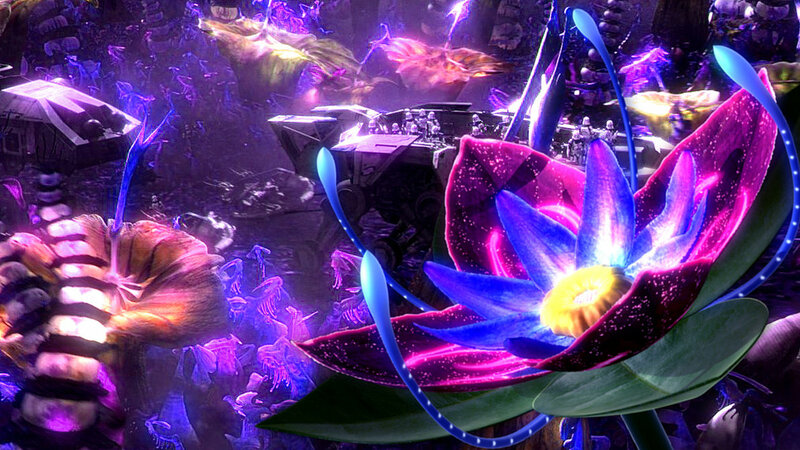 I like the ‘Avatar’ jungle as well, very mysterious and inspiring. Very inspirational stuff mate, I hope to do some sort of scifi stuff this year (god knows I’ve got the lead for it!) 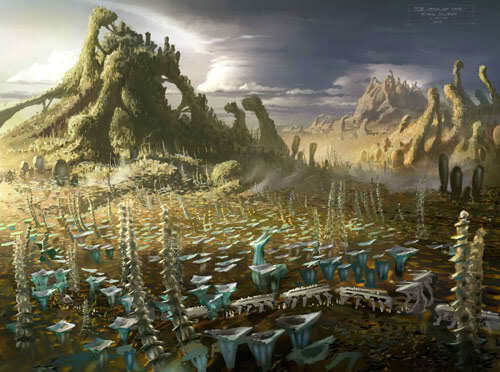 and part of that is to create a bit of a jungly, otherworldly vibe. I’ll try to copy as much as possible from you and Jonas. 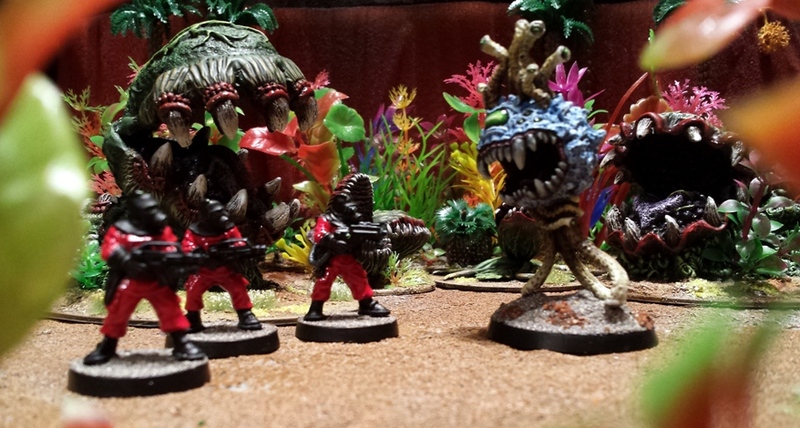 Got some multi coloured lichen in the mail yesterday – that’s fairly oldschool and works just as well on the fantasy table as it does on the scifi table. Multi purpose will be the order of the day from now on. I had a small bag of multi-coloured lichen to hand when putting this stuff together, but by the time I got the the ground cover part of the process my patience was wearing thin. I may add it at a later date… or I may not. I definitely get a bit of a retro kick from seeing lichen used well with modern paint jobs. Curis used the stuff brilliantly with his Furnace Valley squats, worth checking out. Will Stillburg be getting a futuristic, less 19th hole treatment as part of the man-cave refurbishing?